Last week we received our copy of the “Muy Bueno Cookbook — Three Generations of Authentic Mexican Flavor.” From the beautiful food photography to the simple, easy to follow recipes, we enjoyed reading the stories of Evangelina Soza, Veronica Gonzalez-Smith and Yvette Marquez-Sharpnack. This dynamic mother daughter trio bring their love for cooking and their abuelita’s recipes to kitchens across America. To order your cookbook today, visit Amazon. The three started the Muy Bueno Cookbook blog in 2010 with the idea of bringing their grandmother’s recipes to life for future generations. The book offers over 100 recipes: traditional old-world northern Mexican recipes from the grandma’s kitchen; comforting south of the border home-style dishes; and innovative Latin fusion recipes. One of my favorite things to do when I get a new cookbook is to comb through it and tag recipes that I’d like to recreate at home. I snuggle into my bed, turn on the night-light and bring out my little sticky post-it notes. 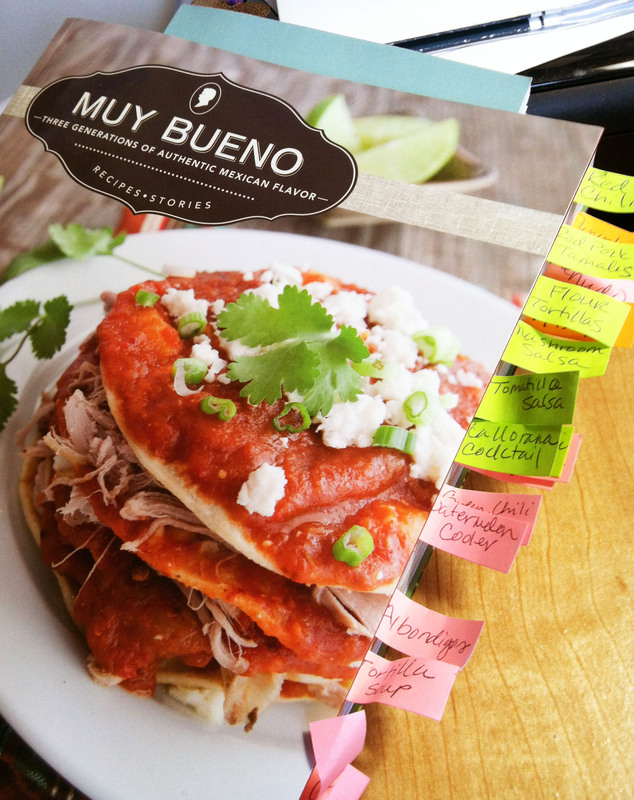 This time when I finished with tagging the Muy Bueno Cookbook, I had to laugh because it looked like I had tagged important pages from research there were so many little notes. I’ve already made their super easy frijoles de la olla two nights ago (beans, onion and salt — that’s it!) and decided to try their Enchiladas Rojas Montadas (Stacked Red Enchiladas). Mind you, my mom would prepare stacked enchiladas, but turned the dish more into a casserole. After stacking she would bake the enchiladas for about 30 minutes until all the cheese melted and got gooey. The Muy Bueno Cookbook version calls for the enchiladas to be stacked without putting them into the oven and recommends to be topped with a fried egg. YUM! In the cookbook, they make theirs with pork. I looked in my refrigerator and realized I didn’t have pork, but chicken breasts. We also switched out the white onions for chopped green onions (again, using ingredients we already had in our kitchen) and we added sliced black olives. I always wondered if the black olives is a California thing? My family places black olives in their tamales and enchiladas. Some people like it, others don’t. I like it. We also added crema in between the stacks. The recipe below I guess you can say was “inspired” by the Muy Bueno Cookbook to be accurate. We served the stacked enchiladas with creamy refried beans from the frijoles de la olla we made the night before. I am definitely going to be making red enchiladas montada over and over again. It was a winner! Heat red chile sauce in large skillet and stir. 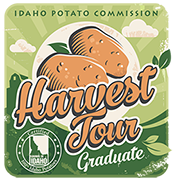 Taste and season with salt if needed. In a non-stick frying pan heat canola oil. Drop 1 tortilla at a time into the hot oil and fry until softened, turning once during frying. Drain on paper towels. Place lightly fried tortillas into the skillet of warm red sauce, one at a time. Coat the tortillas with the red enchilada sauce and place coated tortillas on a place with a large slotted spoon. Layer a chile-coated tortilla with some shredded cheese, queso fresco and shredded chicken. Put another coated tortilla on top and repeat the layers until you have a stack of 3 to 4 tortillas. Continue to make stacks until all tortillas are used. Top with the crema or sour cream, green onions and sliced black olives. Add the chiles to a large pot and add enough water so they are just covered. Bring water to a boil. Lower the heat, cover, and simmer for about 20 minutes. After 10 minutes, turn the chiles over with tongs to make sure the chiles soften evenly. Drain cooked pods and allow time to cool down before blending. Discard water. Fill blender with 3 cups of water, half of the cooled chile pods, 3 tablespoons flour, 2 cloves garlic, and half of the salt. Blend until smooth. Strain sauce through a fine sieve to remove skins and seeds; discard skins and seeds. Repeat blending and straining process with remaining water, pods, flour, garlic, and salt. If necessary, season with more salt. Please note the red chile sauce can be stored in the refrigerator for up to one week or frozen for up to six months.